The position where the station entrance once stood is at the south-eastern edge of a trading estate on Barn Road, Norwich, A147. The site of Norwich City station including its passenger and goods facilities is now mainly occupied by retailing and car show-room sheds alongside an eclectic variety of small businesses from autoparts to scrap-yards. Where Barn Road once ended at the station and became Station Road before crossing the river, the road has been widened and repositioned onto land where the main station entrance stood. A large traffic roundabout lies between the eastern side of the station and the River Wensum. Also on the station’s eastern fringe, bordering the river, land has been turned over to woodland and greenery through which ‘Marriott’s Way’, a well-used cycle track in the national network, threads its way northwards along the edge of the commercialised area. Some remains of a bay platform have recently been excavated by ‘Friends of Norwich City Station’, a voluntary enthusiast group. The remains of the post-war engine shed can be found in the woods between the cycle-way and river. Although the building has been demolished the engineering brick flooring remains in place. A signal box stood immediately north of the shed but no trace of it can be seen. The original bridge across the River Wensum at the northern edge of the station site was demolished by Norwich City Council. It was replaced, by the self-same council, when the track-bed was opened as a cycleway. North of the new bridge the cycleway heads into open country. Although clearly a former railway line no artefacts survive. Notes: City Station was the terminus of the Lynn & Fakenham Railway’s (L&FR) extension to Norwich, East Anglia’s largest settlement. The company had advertised its intention to reach the city in the London Gazette on 21 November 1879. It would do so by building a new railway from Melton Constable to Heigham just west of the city and extending it from there to Norwich. A year later, on 26 November 1880, the L & FR company advertised a plan to further take its line into the heart of the city of Norwich by promoting The City of Norwich Central Station and Railway which it would work on behalf of the smaller company. This new railway would have followed the River Wensum, allegedly on a high embankment, before cutting through the grounds of Norwich Cathedral to reach a terminus more or less mid-way between the Cathedral and the historic Castle Mound. It met furious opposition and was withdrawn at its second reading in the House of Commons so that the whole Bill did not fail. The L&FR thus established its Norwich base at City Station on 36 acres of marshy land at the north-western fringe of the city centre just outside the historic walls. The site was bordered by the River Wensum on its eastern side. By draining and culverting the contractor, recorded as Messrs. Wilkinson and Jarvis, created a flat area of land on which to build the railway infrastructure. They also bridged the river so that their site could be reached from the east of the city. The contractor built a cast-iron road bridge obtained from local foundrymen Barnard, Bishop and Barnard and paid for by the railway company. The station was a substantial structure with an impressive entrance. The street-side facade, in contrasting shades of red and cream brick, featured nine ‘arches’ of four differing heights, balanced from each end of the building. Three either side of the centre arch were topped with circular windows of equal size. The end arches lay under square towers one storey higher than the ground floor giving a balanced and pleasing appearance to the structure. The large centre arch provided a carriage-way directly onto the platform area, whilst the eastern-most arch was open and led to a parcels office and loading bay. The central part of the building above the large arch was finished with a pediment incorporating a ‘blind’ circular window. In his comprehensive book, ‘The Stations and Structures of the Midland & Great Northern Railway (Volume Two)’, Nigel J L Digby reports that the platform side of the building was similarly treated. For the reader interested in gaining more information than can be dealt with here, Nigel’s book can be heartily recommended. For passenger and parcels traffic the station had four platforms, two long on the outer faces and two short bays between the longer lines. 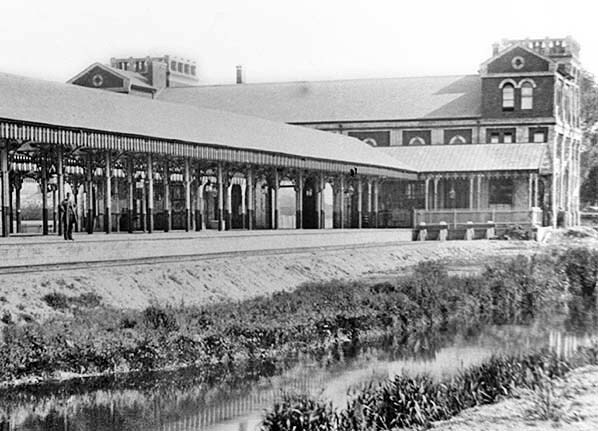 From the road entrance a central carriageway lay between two long canopied shelters supported by ornate cast-iron pillars that stretched from a glazed circulation area beside the station entrance building almost to the bay platforms. The pillars were adorned with E & MR (Eastern & Midland Railway) spandrels, that being the company into which the Lynn & Dereham was absorbed in 1881. The bay platforms themselves offered no shelter to passengers. Passengers entering the station would find their needs catered for on their left where were booking hall, refreshment room and ladies’ waiting room and lavatory. The Station Master’s office lay behind the booking counter area. Gentlemen’s lavatories appear to have been provided in a separate building outside the main structure. On the right-hand side of the entrance arch were parcels and telegraph facilities. The two long outer platforms were arranged one each for arrivals and departures. That on the Up side, to the west, was a single long siding on the platform face. Although paralleled by another siding of equal length no locomotive run-round was provided. The Down, or eastern face was similarly treated but offered an escape for the locomotive of an arriving train. A third line on the eastern side went beyond the station, crossed Station Road and its 3’6” gauge city tram tracks on the level and ran into a yard owned by the city corporation. Beyond that a tiny two-track jetty was provided at the limit of navigation on the Wensum. Beyond the limit of the platforms the railway’s locomotive servicing facilities were constructed between the running lines and the River Wensum. A three-road engine shed, its entrance facing south, was accessed from a headshunt where locomotive coal and drivers’ mess room were located. An engineer’s drawing circa 1893 and reproduced in Nigel’s book, shows a 45 foot turntable on the headshunt south of the engine shed, as do OS 25-inch maps prior to the 1947 edition (which was surveyed before the War in 1938). The turntable was replaced with a 60 foot example in 1931 probably because larger locomotives were in use on the line by that time. This was built not at the site of the smaller turntable but a short distance further north where a line with ash pits led past Norwich South signal box to the new locomotive turntable. The old turntable was removed and its pit infilled. When Norwich City station, like so much of the city, suffered massive destruction in Nazi bombing raids at the end of April 1942 (more of which later in this piece), the engine shed was damaged beyond repair. It was soon replaced by a very utilitarian flat-roofed structure of just two roads, without doors, with its walls supported by steel columns sunk into square concrete post bases. 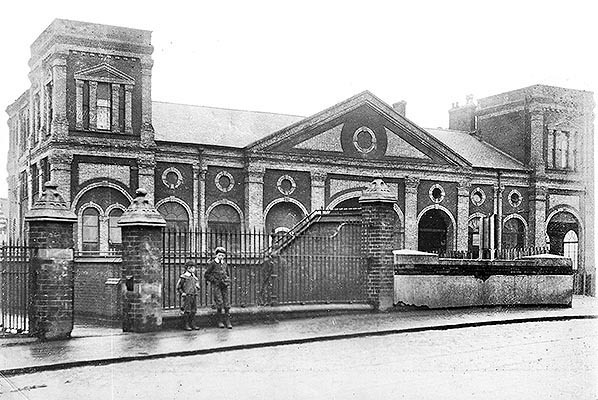 The original building was a much more handsome affair, brick-built with a tiled roof and smoke stacks rather than the corrugated iron clerestory that featured on its replacement. The station boasted extensive goods facilities. 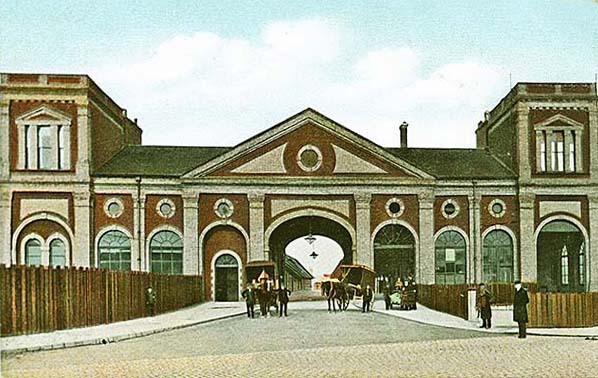 At the goods yard’s road entrance from the city an attractive brick stables-block housed the railway’s horses that worked parcels and goods deliveries around the city. It had a slate roof with a glazed clerestory where opening lights provided ventilation to the 24 stalls. To the west of the station platforms a siding served Messrs. Cushions timber yard, on its way passing a compound occupied by the Norwich Gas Company. A lengthy two-road goods shed with offices at the ‘town’ end occupied two sidings. West of them lay a shed, dedicated to grain traffic, with a loading platform and two short sidings. An extensive yard with eleven long sidings provided facilities for a large number of merchants’ compounds. Around fifty different companies used the site at one time or another in the first half of the 20th Century. At the north end of the yard the siding was lined with cattle pens. The northern-most two sidings were not constructed until 1931. These served the needs of Norwich Corporation to receive stone for road-building. Alone amongst the goods sidings it had a crossing for locomotive release. All of the sidings were shunted from the north and the last northern outposts of Norwich City were two headshunts that allowed the yards to be worked without fouling the main line. These ended at the point where the running line to Melton Constable crossed the River Wensum on a riveted steel bridge. At first the station had two signal boxes: South near the station and North on the down side opposite the Corporation sidings. North ‘box was at the commencement of the single main line and, as such, held the tablet for the first section as far as Drayton, four miles distant. This ‘box closed in 1932 and the single-line tablet instrument was moved to the south ‘box. Thereafter a complicated bell procedure allowed shunters to communicate with the signalman so that the goods yard might safely be worked without lengthy walks to exchange information and obtain movement orders from the signalman. Just before midnight on Monday 27 April 1942 began a week of bombing that left many of the factories and residential areas in and around Norwich in almost total ruin. The Nazi campaign, part of a wave of raids on historic cities allegedly compiled from pre-war Baedeker tourist guides, continued each night that week until the early hours of Friday. There were many casualties causing both deaths and serious injuries amongst the civilian population. Although the historic Cathedral, Castle, many other churches and the Guildhall were left untouched, City Station was completely devastated (see the pictures below). It is quite fair to say that the station was never returned to its glory days. By 1944 the remains of the grand station building had been cleared. In its place, where the eastern side of the demolished building had stood, there was a very stark flat-roofed concrete slab structure housing the station’s passenger facilities. The arched entrance to the platforms was, of course, no more. Instead, a wide open-air carriageway led to the platform area where access was controlled by two simple wooden gates. A new platform roof was added, built onto some of the pillars that had previously supported the down (eastern) side platform shelter. It can be seen from contemporary photographs that many of the iron pillars had survived the blitz in 1942 but the roofs were totally destroyed. The station was visually, by the early 1950s, a sadly diminished place. Mondays and Thursdays an additional train left at 9.20 in the morning for Melton Constable. Trains at 7.40am, 11.05am and 7.45 in the evening either gave a good connection or joined trains for Lynn and beyond at Melton Constable. A market day train left at 5.10pm on Saturdays: on weekdays a 5.30 departure ran just four miles to Drayton, returning eight minutes after arriving there. Seven down trains from Melton Constable terminated at Norwich on weekdays: the Saturday market train arrived at 11.27am. As with up services, three offered connections or through carriages from the west. There were two Sunday down trains. In the up direction a non-stop working to Melton Constable left at 2.10 in the afternoon. Ten minutes later a stopping service followed it! None offered anything like good connections at the junction in either direction. In 1906 Norwich offered seven weekday departures. Five stopped at all stations to Melton Constable, taking around 50 minutes for the trip. At 9.50am an express set out conveying through carriages to Leicester and Nottingham. They joined carriages from Lowestoft, Yarmouth and Cromer at Melton Constable. An additional Saturday departure left at 4.45pm, a market-day train for customers at the city’s large produce and agricultural market. There was an exactly balancing number of down trains arriving in the city. The daily express from the Midlands arrived at 6.25pm. Unlike the up service it made two calls on the Norwich branch, at Drayton and Hellesdon. The market train arrived on Saturdays only at 11.25am. Bradshaw’s Guide for March 1906 shows no Sunday service. In the summer of 1922 trains ran on weekdays only, five in each direction calling at all stations on the Norwich line. City station sent out and received two expresses each day conveying through carriages to and from Leicester London Road and Birmingham New Street. The M&GN line was little affected by Grouping in 1923, passing into joint ownership of the new LMS and LNER concerns but remaining nominally independent. It retained the Midland & Great Northern Joint Railway name. By agreement between the companies the LNER assumed operation control on 1 October 1936. With Nationalisation in 1948 the M & GN lines passed from operational control of the LNER into British Railway’s Eastern Region and all vestiges of ‘joint’ management ceased. In 1949 the Norwich City line was busier than we have seen previously: nine weekday trains ran to Melton Constable between 6.26 in the morning and 7.15pm. The 9.30am departure conveyed through carriages to Birmingham (New Street) and Leicester (LMR). The railway’s managers obviously expected Norwich to be a lively place on Saturday evenings because they scheduled two late trains. One, at 10.45, ran only as far as Whitwell and Reepham, 13 miles from the city. Fifteen minutes later a through working to Weybourne followed it. There were nine down trains on weekdays, ten on Saturdays. The balancing working of through carriages from Midland cities arrived at 7.13 in the evening. The timetable that commenced in September 1958 was to be the line’s final passenger offering. Diesel Multiple Units had appeared on East Anglian lines in September 1955, after which they gradually took over most local trains, leaving only through expresses steam hauled to the end. The last timetable offered passengers nine up and down trains on weekdays and two more on Saturdays: almost all were second class only and faster than a decade earlier, suggesting that they were DMU trains. A 1.43pm departure from Melton Constable, the only train of the week to offer first class seats, was slower than its weekday equivalent and appears to have balanced a similarly slower, but second class only, 12.22pm from Norwich City. This may indicate last surviving steam workings on the line. Apart from this one return trip, all services appear to have been operated out of Melton Constable. The table shows no through Midlands service. Goods traffic apparently thrived throughout the life of the station and continued to be important, particularly in respect of coal carriage, after passenger traffic ceased from March 1959. During a 12-week sample period ending in October 1958 the four Norwich stations handled goods in order of 70,000 tons, of which more than 25,000 passed through City station’s yard. On 12 September 1960 a short, tightly curved new length of railway was constructed at Themelthorpe, approximately 15 miles north of Norwich. It joined the former Great Eastern Bure Valley line from Wroxham with the Midland & Great Northern near where the two had crossed without connecting. This new line allowed goods traffic to continue to reach Norwich City despite closure of almost all of the M&GN system. It continued in use long after the line into Norwich closed to serve quarrying at Lenwade. In May 1958 a report was finalised by British Railways. It concluded that the entirety of the M&GNJR was loss-making, and was largely duplicated by routes of the former GER. Complete closure of passenger services was proposed. Extensive consultations demonstrated some opposition to the plans but there was widespread public apathy and meetings were sparsely attended. Norwich City station closed to passengers on and from 2 March 1959: the last services had run on Saturday 28 February. The line gradually lost its remaining goods traffic and by 1968 Norwich City was at the end of a siding from Lenwade, 10½ miles distant. When coal movements were transferred to Victoria station Norwich City finally closed to all traffic on 24 February 1969. Route map drawn by Alan Young. Tickets from Michael Stewart. This interesting but undated photo taken from the trackside near the ‘arrivals’ platform, appears to show Norwich City station in a "nearly new’’ state. It was probably taken soon after opening in December 1882. 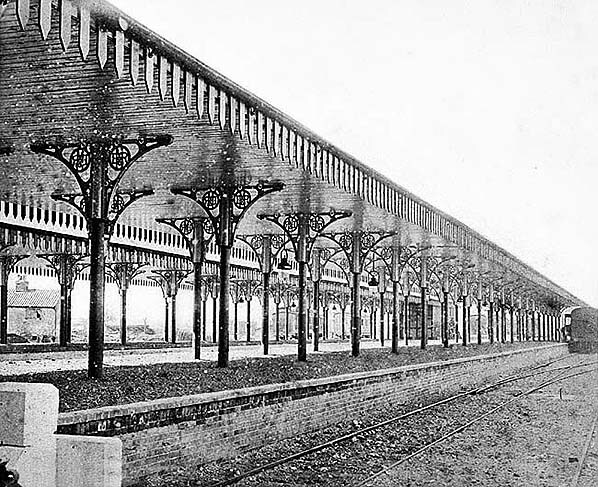 The canopy valance is not yet stained with locomotive smoke; the buffer at the end of the headshunt is not scuffed or work-stained; the underside of the canopy is freshly painted and the carriage road along the platform looks newly laid. As first built, the run-round loop led directly to a loco turntable out of shot to the right. It was later replaced with a larger model near the engine shed. In the background there are two six-wheeled carriage occupying the siding beside the ‘departures’ platform. 1886 1:2,500 OS map. The station shortly after construction. The original 45 foot loco turntable was in place and could be accessed from the shed end and directly from the platform run-round. The sidings for coal merchants were complete. Click here for a larger version. 1907 1:2,500 OS map. By 1905 the goods facilities had been enhanced with a second goods shed, stables and weigh bridge and the direct platform access to the engine shed via the turntable had been removed. Click here for a larger version. 1947 1:2,500 OS map. The 1947 map was surveyed in 1938, before World War 2. For much of the city of Norwich the understandable but late publication rendered the new map extensively inaccurate. Much of the city was destroyed in April 1942. As regards City station, the engine shed is wrongly portrayed and the original platform canopies and station building are shown. The Norwich Corporation sidings north of the terminus were in place by this time. Click here for a larger version. An interesting view of 2-4-0 locomotive No.3A outside the first engine shed at Norwich City, sometime prior to 1899 when this locomotive was withdrawn. No.3A was from a batch of 0-6-0 Tanks acquired from the Cornwall Minerals Railway and one of, it is thought, a pair converted by Marriot into 2-4-0 Tender form. An illustration of one of the pair shows it carrying Eastern & Midlands Railway livery and the number '18' but among the many unclear aspects of the ex Cornwall locomotives is the number carried by the other rebuild and which of the pair became No.3A under the M&GN. 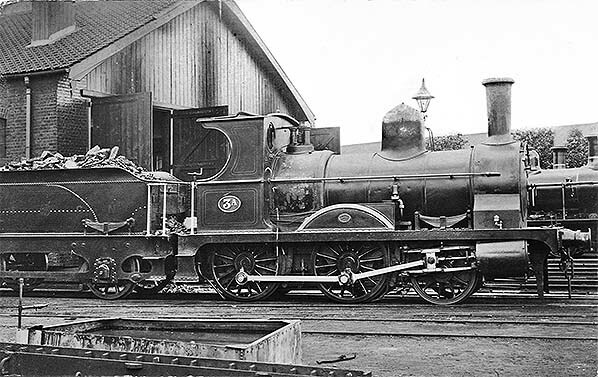 Whatever the truth, withdrawal came in the 1898 - 9 period and the number 3A was reapplied to one of the 0-6-0T's, in December 1899, which later became No.95 and then LNER Class J93 No.8485 until withdrawal in December 1947. Norwich City station frontage c1902. 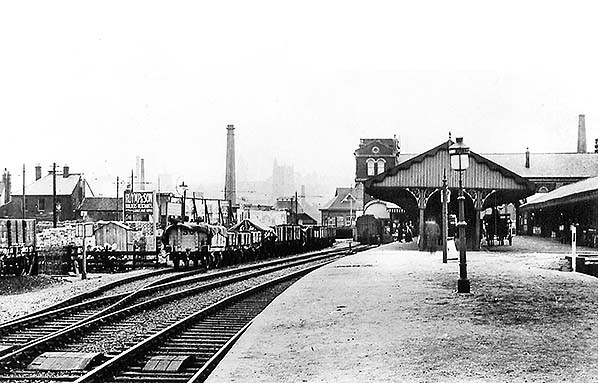 The west platform and station building at Norwich City around 1900 seen from where a siding to serve Cushion’s timber yard would be provided in 1917. The drainage channel in the foreground was culverted under the station from the River Wensum and, in effect, put the station on an artificial island constructed by the railway builders. Norwich City taken sometime after 1901 looking along the east platform towards the city centre. The large arch led to Station Road which curved alongside the station where the power supply posts for the city’s 3’6” trams can be seen. The train of trucks are on the line that crossed the street into the corporation yard and onto the twin wharf on the Wensum. A postcard image of the imposing building at Norwich City from about 1905. The central arch led to the platform areas, passenger facilities were on the left and the open arch on the right was the entrance to parcels and telegraph offices.